Welcome to Marvel Strike Force Heroes page. This is the full description of MSF Kingpin stats, skills, and abilities. Kingpin is a Protector who supports his team with Offense Up and Defense Up. His first skill inflicts medium damage and provides the Kingpin with a chance to gain assistance from others. His second skill summons 2 bodyguards who have taunt on themselves when summoned. Kingpin ultimate buffs his allies with both Defense Up and Offense up for 2 turns making Kingpin irreplaceable in any Arena team who have AOE damage dealers. Kingpin passive grants chance for Team Attack for any villain-hero in the team. Kingpin doesn’t have Taunt but his ability to apply Offense Up to the whole team on the beginning of the second turn in battle makes him the most important hero of any AOE based team. His price is 45 shards but which can be farmed through 6-9 Villains United campaign mission, 7-9 Nexus Campaign mission, and 8-6 Nexus campaign mission. He can also be obtained from Mega Orbs and Premium Orbs. Kingpin is a demanding crime boss who summons bodyguards and orders allies to attack. 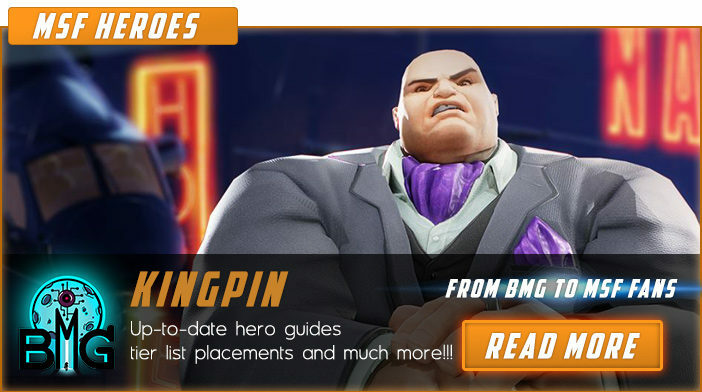 We hope that you enjoyed the description of MSF Hero Kingpin. For detailed information about other MSF Characters check our MSF Heroes page.